Anyone with a standard DVD or disc drive can watch and enjoy a PowerPoint presentation or photo album that you create. You need a DVD burner and burning software to complete the steps listed below. 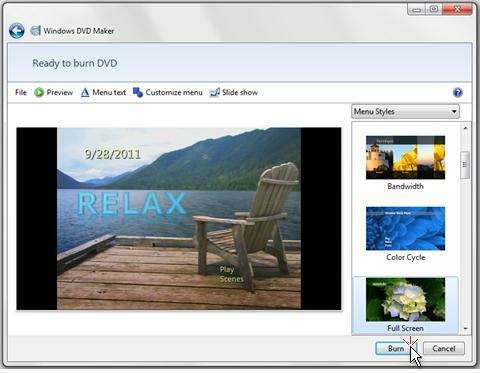 Windows DVD Maker comes with Windows 7. However, if you're using a newer version of Windows, you need to get third-party DVD authoring software separately. See the link in step 2 below. First, convert your slide show to a video in PowerPoint. To do that, see Turn your presentation into a video. Next, open Windows DVD Maker or another third-party DVD authoring software. Browse your file system to locate and select your newly created slide show video file, and click Add. Insert a blank writable DVD into the DVD drive you selected, and click Next. To start the DVD burning process, click Burn. You can also save your presentation to a CD. To do that, see Save your presentation to a CD. You need both a DVD or disc burner and Windows DVD Maker (or other 3rd-party DVD burning software) to complete the steps below. Save your slide show as a video (as described in Turn your presentation into a video), and select the Internet & DVD option when choosing the video quality. Browse your file system to locate and select your newly created slide show video (.wmv) file. Click Preview, and then click Burn to start the DVD burning process.